Ulm is located on the rivers of Danube and its tributary Blau, at the border to Bavaria. It has the youngest university of Baden-Württemberg and soon it will get a second tramway line, but above all Ulm can call a church tower the highest one in the region. And that makes people of Ulm very proud. The tower of the Minster of Ulm measures 161 meters and 53 centimetres, the biggest Protestant church in Southern Germany. Rich merchants of the city had financed the construction of the church, therefore the Minster is known as ‘Bürgerkirche’, church of citizens. This might explain the particularly close relationship of citizens with the church and the old saying „ money of Ulm rules the world“. Some even claim this is still the case today. The architectural modern ‚Stadthaus’ at the Münsterplatz, the ‚Fischerviertel’ on the river Blau and the Monastery of Wiblingen with a beautiful baroque library are worth seeing. Each year in July Ulm is celebrating the day of its first constitution in the 14th century on the traditional ‘Swear Monday’. The International Danube Festival is held every two years. Famous personalities: Albert Einstein, the worlds most known theoretical physicist (1879-1955) and Hildegard Knef, the well-known German actress, singer and writer (1925-2002) were born in Ulm, partisans Hans (1918–1943) and Sophie Scholl (1921−1943) lived in Ulm until their death when their family moved here from Ludwigsburg in 1932. Population of Ulm: 124.000 inhabitants. Barbara Kluntz was a woman with many talents. It is not known, where and from whom she got her musical training. Only as late as of 1704, when she joined the protestant spiritual women (Sammlungsfrauen) in Ulm, there exist notes about her activities as piano teacher and composer. At that time, she was already 44 years old. Whatever caused her to join this women’s association at such an age – especially at that time, the beginning of the eighteenth century – has not been handed down. Since she was accepted with her maiden name, it can be concluded that she was not a dowager. Only little, too, is known about her childhood. She was the third child of Peter and Katharina Kluntz, born Messerschmid. Since her father was a tailor by profession, she was nicknamed “Schneiderbärbele (the tailor’s barbie)“ as a child. It is remarkable that she was portrayed in 1717 as one of the spiritual women, the painter is unknown. The painting is shown on the preceding page. This portrait shows Barbara Kluntz with the essential ingredients of her life: a small cross, one of her choral books, writing utensils, and in the background her own (most probably) organ. She regarded herself as an “enthusiast of fine music art“. Among other works, Barbara Kluntz created the “Music and Choral Book“ of 1711 and the „Clavier Music Book“ of 1720. Both works today are in Ulm‘s city archive. A choral book from 1717 remains lost. These music books contain in part own compositions, songs and arias as well as singular compositions of spiritual songs which were sung during church services in Ulm. Most probably, Barbara Kluntz performed, together with her piano students, concerts at the cathedral chapter of the spiritual women and presumably at the Schwörhaus, too. In memory of this highly gifted woman, a street at Ulm‘s Safranberg has been named “Barbara-Kluntz-Weg“. The painting mentioned above can be found at the Ulm Museum. day of the judgement. She died at 21. Sophie Scholl was born the third child of Magdalena and Robert Scholl in Forchtenberg in 1921. In 1932, her family moved to Ulm. Her father had become partner in a tax consultant’s office. Soon after, Sophie Scholl joined the Nazi youth organization “League of German Girls”, fascinated by the Nazis’ ideal of community. Little by little, she started questioning the Nazi regime and grew to oppose it. Hoping to avoid the Reich Labor Service, she started training as a kindergarten teacher after graduating from high school. Because her training was not accepted as an equivalent substitute, she had to do a year of Labor Service before she could study biology and philosophy. For her studies, she moved to Munich in 1942, where her brother Hans was studying medicine. At this time, Hans Scholl and his friends were publishing leaflets under the name of “White Rose” that fiercely criticized Hitler’s policy. Sophie Scholl joined them and for the first time participated in one of their operations in January 1943. While distributing the sixth leaflet, Sophie and her brother were caught throwing leaflets into the university’s atrium from a balustrade. Both were immediately arrested. Three days later, Sophie Scholl was sentenced for high treason and murdered. In Ulm, a high school is named after the siblings Hans and Sophie Scholl. The Hans and Sophie Scholl Square is in the new town center. In the town hall, bronze busts have been set up in their honor. They were made by Otl Aicher, their sister Inge’s husband. The Scholl family’s first house in Olga street was renamed “House of the Scholl Siblings”. In its modern extension, the Scholl family is commemorated with pictures and quotes. Agnes Schultheiß was actively involved both socially and politically: she was a co-founder of the “Rettungsverein Guter Hirte (rescue association Good Shepherd)“ in 1908, and joined the town council of Ulm in 1919 as one of the first elected councilwomen. Agnes Schultheiß was born in 1873 in Danzig (Gdansk) in Poland, the eleventh of twelve children of a liberal upper-class family named Landmann. After having married the postal inspector Franz Schultheiß the family moved to Ulm in 1906. Before their move she worked as teacher at a secondary school for girls in Gdansk. She not only completed an educational training but finished – as one of the first women ever – her university studies in philology at the university of Oxford. Later, when women were officially allowed to study in Prussia, Agnes Schultheiß joined the university in Bonn and committed herself to the study of linguistics and literature. Once in Ulm, she got involved in the catholic parish as well as in the civil women‘s movement. Agnes Schultheiß co-founded the rescue association Good Shepherd. This association took care of young girls who became pregnant and were outcast from their family homes. In 1912 she became chairwoman of the association and remained in this position until 1939. Thereafter she was honorary chairwoman until she died. Politically she stood up for the voting rights for women. The above-mentioned quotation dates back to an electoral address, which she gave at the then Saalbau, (today Bahnhofstraße 8). 1919 she was the third woman to join the town council in Ulm, following Katharina Lutz (a midwife) and Emmy Wechßler (a manufacturer dowager). She belonged to the town council until 1928. In memory of Agnes Schultheiß, there is stele (one of ten at this time) in the Bahnhofstraße, which is dedicated to her life achievements. In addition, the newly designed place in front of the Weststadthaus was named “Agnes-Schultheiß-Platz“. Ilse Schulz always focused on people. This principle was her guiding idea, and she acted according to it. As head matron with a great deal of know-how, she influenced the reform of care at Ulm University Medical Center in the 70s and 80s. At the same time, she stood up for equal chances of men and women in career and society. After her retirement, the historian and author of books wrote about women’s lives and did research on the roots of nursing in Ulm. Her first book was based on this research: “Sisters, Beguines, Masters. Hygesia’s Christian daughters in a city’s health care. A contribution to the history of nursing and medicine”. She later concentrated on women from Ulm, often overlooked by official historiography. In her book “Faded traces”, she shows how female citizens contributed greatly to developing health care, the social sector, the economy and culture of Ulm. They did so in many professions, as nuns, founders or like Agathe Streicher, the only woman in 16th-century Germany officially recognized as a doctor. In commemoration of Ilse Schulz and her significance for the hospital and city of Ulm, an activity group set up a drinking fountain at Ulm University Hospital. The fresh water is a source of strength for all patients, staff and visitors. 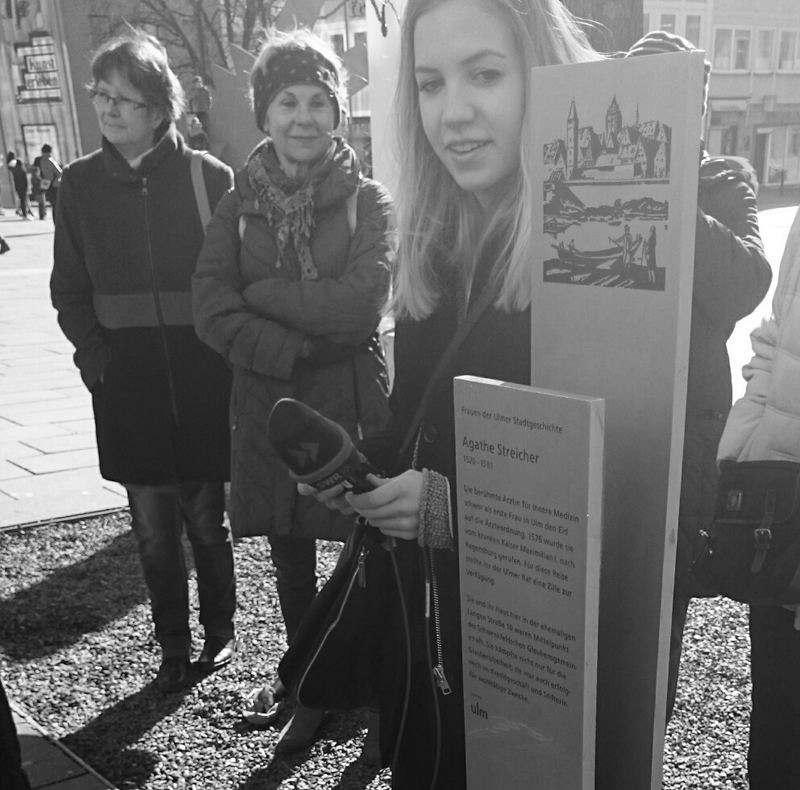 In 2002, the first seven memorial steles for women from the seven centuries of Ulm’s town history were put up. Baden-Württemberg’s Ministry for Social Affairs co-funded the project, which aimed at highlighting the achievements of historical women. Ilse Schulz played an important role in the implementation: with Eva Noller, she proposed the women from Ulm’s history and provided dates and texts. After retiring in October 1984, she committed herself to researching women’s history. She made a significant contribution to better understanding history with her many projects, activities and publications. For her merit, she received several awards from the City of Ulm and Baden-Württemberg region. Ilse Schulz died on 31st January 2009. Mathilde Wieland was the successful director of the metal processing company Wieland in Ulm for about 20 years, at a time, when the role of women was more or less restricted to being wife and mother. At the age of 24, Mathilde Wieland married her uncle Philipp Jakob Wieland, who was 45 years her senior. Since the death of his wife in 1860, she had kept his household. The marriage took place in 1862. Not much is known from the time before her wedding, only that she had no formal education and – as was general custom at the time – was waiting for a socially acceptable marriage. The marriage was blessed with four children, two daughters (*1864, *1866) and two sons (*1863, *1867). When her husband died in 1873, Mathilde Wieland took over his company. She managed it together with a commercial and a technical director. To her, the employees‘ welfare was of utmost importance as can be seen from the quotation above. It was found in a letter to her employees. In the same year she was responsible for the setup of a pension fund. Every year at the day of death of her husband, the oldest employees received the interest of a certain amount of invested capital. In 1922 this pension fund was the basis for the Wieland Foundation, which even today is the trustee for the current company pension plans.